Abalone is not the most common ingredient you'd see here in the US. In Korea though, it's very popular. Well they're sort of pricy so you wouldn't eat it everyday but it's on their menu occasionally. If you like clams, you'll probably like it. I like grilled version of it too. Mmm yum. 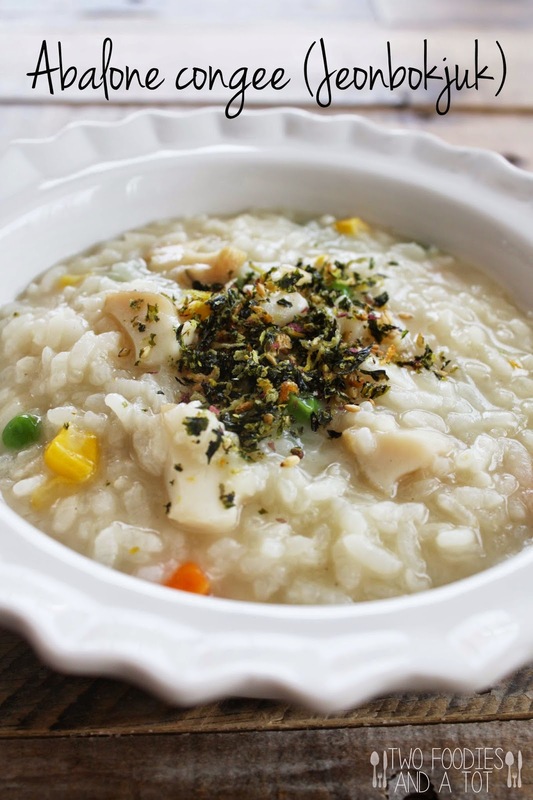 I love this type of congee(rice porridge) any time of the year but especially when it's cold. I've had this craving for abalone congee for a couple of months now and I finally got some frozen abalones when I went to a Korean supermarket. Fresh ones definitely have a different depth of flavor but I will take whatever I can! My tot loves congee with lots of veggies. And he gobbled up a whole bowl of this, including abalone. It's actually the first time for him to try abalone and I was pleasantly surprised that he didn't mind the different texture of abalone. It's got a little bite but not too chewy if you cook it right. He said he enjoyed his lunch so much. Haha. My little adventurous eater. It's funny how I am on more adventurous side when it comes to food but I am definitely more open to seafood than anything. I think he's the same way. 1. Wash and soak rice in water for at least 30 minutes. 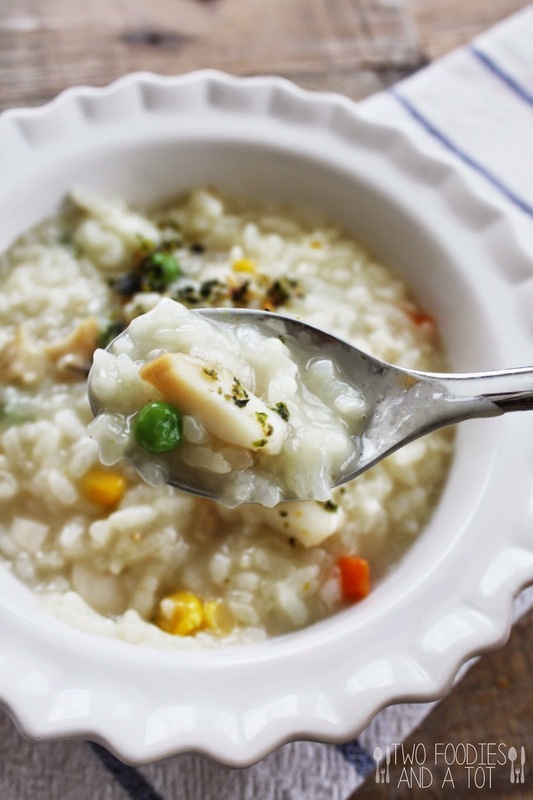 Depending on how starchy you want the congee, change the sweet rice and regular rice ratio. 2. Heat 1 tsp sesame oil in a pot and saute diced abalone on medium heat for 2 minutes. Add vegetables and drained rice and saute until rice is half translucent. 3. Add stock or water and bring it to a boil on high heat. Once it comes to a boil, lower the heat to medium low and let it cook stirring occasionally about 20 minutes or when it reaches to consistency you like. 4. When it's ready, stir in fish sauce and soy sauce to taste. Add a few drops of sesame oil if you like. Garnish with crusted roasted seaweed.